FLOWER GIRL: Meridith Isaacson in her flower shop, Verde & Co.
Meridith Isaacson calls the organized and controlled chaos of Valentine’s Day the “floral Olympics.” That’s not too surprising, given that she’s a floral designer and the owner of flower shop Verde & Co. (South Lake Union, 400 Fairview Ave. N), where she preps for a typical Valentine’s Day two months before the holiday hits. The preparation includes formulating original “recipes” for bouquets; taking marketing photos; doubling her staff; planning meetings; arranging flowers; making schedules; and last but not least, ensuring her team has something to eat. Isaacson, who spent almost a decade training in classical ballet, says that her background helps keep her focused and organized during holiday rushes like Valentine’s Day. 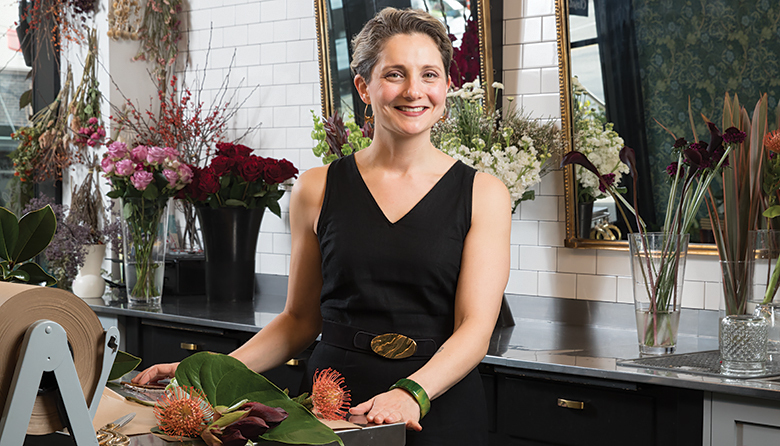 She was drawn to working with flowers after leaving the dance world when she moved to Seattle in 2007, and enrolled in floral design classes at the now closed Floral Design Institute. “I wanted to have more movement in my life, and it had to have color,” she says. Isaacson has since become known for her lush, textured, architectural arrangements—a poetic bridge between her dance and floral design backgrounds—and she’s learned a lot since opening her small, bright storefront four years ago in Seattle’s rapidly growing South Lake Union neighborhood. She’s developing supportive relationships with her retail neighbors, such as art and design marketplace Join Shop, with which she occasionally cohosts events. She’s also committing to sustainability and responsible product sourcing through the Slow Flowers movement, whose members are dedicated to using American-grown flowers whenever possible. There’s no doubt Isaacson’s flowers make many people happy on Valentine’s Day, but what is she hoping for on that romantic holiday? “Every arrangement tells a story. My goal is to make sure that everyone leaves with a piece of art,” she says. While growing up, Isaacson worked in her family’s New York–based trucking business, started in 1913 by her great-grandfather from Italy, who was a blacksmith and built wagons. “My favorite flower. They are resilient...being resilient is the thing that has sustained me in my life,” says Isaacson. Isaacson sources some stems locally from Hori Hori Flowers in White Center and from the Seattle Wholesale Grower’s Market in Georgetown. including Floral Design 101, wreath making and terrarium design. Isaacson is also teaching a flower crown workshop at the Northwest Flower & Garden Festival on February 22.